Walking through the doors of Old Port in Montreal's Phi Centre, I felt like I had been given a Golden Ticket to Mr Wonka's Chocolate Factory. I had viewed teasers from the exhibition on social media and follow some of the creators and the visit was on my Montreal to-do list from the moment I stepped off the plane. It did not disappoint. Discover the universe at a non-human scale and gain new insights on space travel, climate change and mass migration. 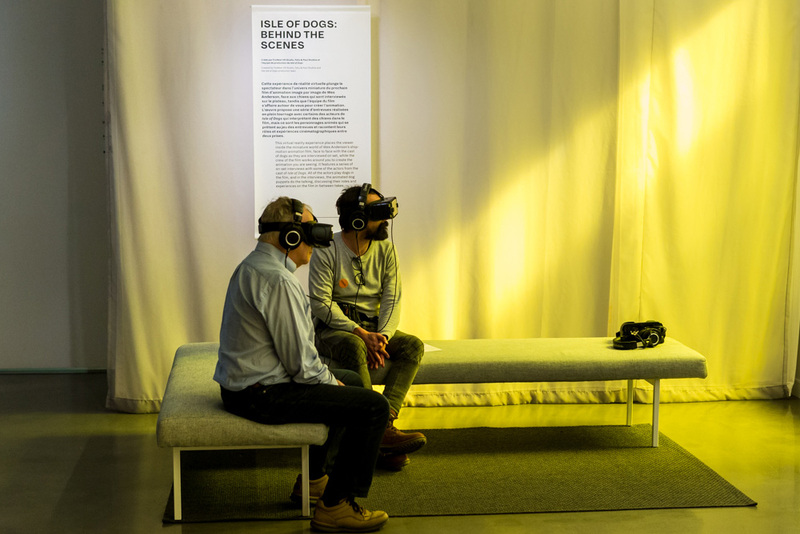 Covering themes so close to my heart, and offering very different experiences, the exhibition is an absolute must for anyone interested in Virtual Reality, immersive storytelling, design, art, documentary film and raising empathy through storytelling. Highlights included going behind closed doors at NASA, discovering the inner workings of a sequoia tree, uncovering the wonders of the Hubble Telescope, standing aside the female warriors fighting back against the ISIS soldiers that sexually abused them, flying through the Chalk Room, and viewing the world from the perspective of different animals on a forest canopy floor. Each experience celebrates the great opportunities for storytelling in immersive Virtual Reality, cultivating compassion as the stories lift the veil on climate change, mass migration, and women's empowerment to challenge our views on nature, violence, and justice. You have until August 12th to go check it out - I will be going back for a second serving. Chalkroom is a virtual reality work created collaboratively by multimedia artist Laurie Anderson (United States) and mixed media artist Hsin-Chien Huang (Taiwan). While experiencing the work, the “reader” flies through an enormous structure made of words, drawings, and stories. Words sail through the air as emails. They fall into dust. They form and reform. The experience, which has been shown at the Massachusetts Museum of Contemporary Art, the Taipei Museum of Fine Arts, and the 2017 Venice International Film Festival—where it won Best VR Experience (for Interactive Content), as La Camera Insabbiata—brings shape and dimension to the concept of story. Once you enter the work, you are free to roam and fly. Crystals, lasers, monsters, heroines. Transform into fantastical female warriors in this social virtual reality experience. Six people can band together to battle evil in this epic journey of empowerment, set to “Chorus,” a track by Justice. Discovery Tour by Assassin’s Creed: Ancient Egypt is a dedicated mode of the game that lets visitors free-roam beautiful ancient Egypt to learn more about its history and daily life. It is a world to discover and explore; a world free of conflict, time pressure, or gameplay constraints. This way, everyone—from players to history enthusiasts and even non-gamers—can discover at their own pace or set out on guided tours curated by historians and Egyptologists. Explore the cosmos through the lens of the Hubble Telescope. Journey to the Orion Nebula and experience the birth, life, and death of a star. The atoms in our bodies were forged inside the furnaces of stars, therefore, we are literally stardust. Fistful of Stars is an immersive encounter with the cosmos that deepens our understanding of the universe. Through virtual reality, viewers are transported thousands of light years away as they discover that humans and the stars are connected. Fistful of Stars is accompanied by The Hubble Cantata, a musical composition by Paola Prestini, performed by a 30-piece ensemble, 100-person choir, and two singers from the Metropolitan Opera. This artistic interpretation of how animals view the world allows you to explore the forest through the eyes of four woodland species. In the Eyes of the Animal was developed by creative studio Marshmallow Laser Feast (MLF). MLF delights in exploring the boundary between virtual and real-world experiences. Created using unmanned aerial vehicles (UAVs—also known as drones), LIDAR scans, and bespoke 360° cameras, this visual experience is complemented by a meditative binaural soundscape that incorporates audio recordings from United Kingdom forests. This virtual reality experience places the viewer inside the miniature world of Wes Anderson’s stop-motion animation film. It features a series of “on set” interviews. With a selection of actors from the cast of Isle of Dogs. All of the actors play dogs in the film, and the interviews feature the animated dog puppets talking as the actors themselves as if between takes, discussing their roles and experiences on the film. Roxham, created by Michel Huneault, with Maude Thibodeau and Chantal Dumas, produced by NFB, in collaboration with Le Devoir, Phi and Dpt. Photographer Michel Huneault takes you to Roxham Road, the location with the largest number of irregular border crossings by asylum seekers moving from the United States to Canada. Close to 20,000 people were intercepted here in 2017, a record number. Between February and August 2017, Huneault spent 16 days here, arriving early in the morning and leaving at nightfall, and documented more than 180 border-crossing attempts by people from more than 20 countries. Roxham is an immersive experience based on 32 true stories. Space Explorers: A New Dawn, created by Felix & Paul Studios, in collaboration with NASA, Oculus and Headspace Studios. Space Explorers: A New Dawn is a cinematic virtual reality experience about the new age of space exploration. Witness the lives of NASA astronauts as they navigate the trials and sacrifices of their training and missions. Explore the camaraderie of space programs around the world, and discover the latest advancements and plans for deep space exploration. Space Explorers: A New Dawn shines a light on mankind’s most ambitious journey to understand our planet, our universe and our origins. If you have ever looked at a tree and dreamed of climbing to the heights of its canopy, glimpsing its inner workings, or dialling into its particular rhythms, Treehugger: Wawona is a virtual reality installation from Marshmallow Laser Feast (MLF) that sheds light on this world beyond, rendering the invisible visible at last. Treehugger seeks to convey the immense scale of these trees and to question our relationship with the natural world during a time of crisis and change. MLF follows the principle that a person must relate to a subject to be moved or inspired by it. In the field of conservation, to wish to save something, you must first fall in love with it.